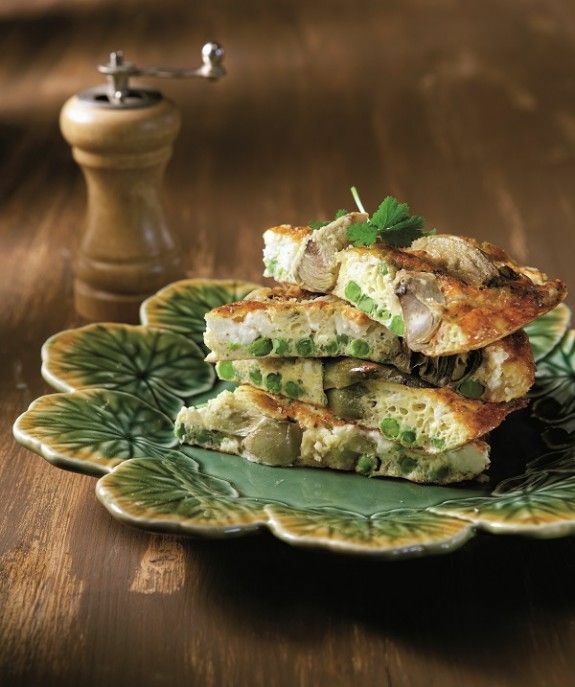 This hearty omelet is perfect for lunch or light dinner! Serve with crusty bread and green salad. In a pan with boiling salted water cook artichokes for 5 minutes. Drain well. In a small frying pan heat oil. Dust artichokes with flour and fry on both sides until nicely colored. Beat eggs in a bowl with milk, cheese, parsley and peas and season with salt and pepper. Pour over artichokes. When frittata is ready on one side, turn over with the help of a plate and cook for another 1-2 minutes until done. Serve on a plate, sprinkling with parsley.